Spray There are 3 products. Flow Brill is a non-oily-looking spray cleaner-polisher to prevent dust stickiness on dashboards and prevent glares and reflected sunlight. 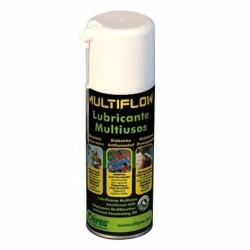 Multiflow Aflojatodo is a multipurpose anti-corrosion lubricant spray that is essential for workshops, industry and the home. 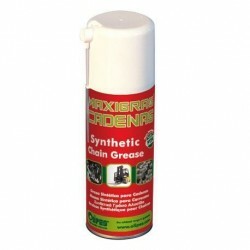 Maxigras Cadenas is a Teflon grease (with PTFE), light-coloured spray, specially formulated for the lubrication of chains subjected to heavy stresses and adverse climatic conditions (water, snow, dust, mud, etc.). .